Here's a must read for all Buffalo Sabres fans. 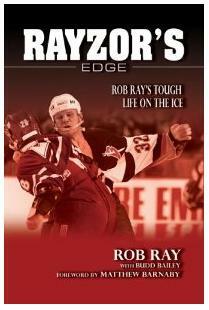 Popular tough guy Rob Ray is releasing an autobiography called - Rayzor's Edge: Rob Ray's Tough Life on the Ice . Rob Ray was known as one of the NHL’s toughest players of the 1990s. During his thirteen seasons with the Buffalo Sabres he twice lead the league in time spent in the penalty box. Ray was known for his jersey-off fighting style, which eventually led to the “Rob Ray Rule” banning that practice. In Rayzor’s Edge, Ray shares many humorous and insightful stories from his Sabres career.